While we’ve always given you ladies ample options as far as bags and shoes are concerned, this pair right here is made for the boys – specifically the boys (and men) who love a pair of clean cut sneakers with just the right amount of edge. If you find the silhouette rather familiar, you’re right. Relaunched back in Dior’s Spring 2018 collection, the iconic B01 has made a return with all-new elements that make them a truly coveted pair of sneakers. Do a search online for B01 and you will find that there are subtle differences between the one you see above versus pairs way back from seasons past. 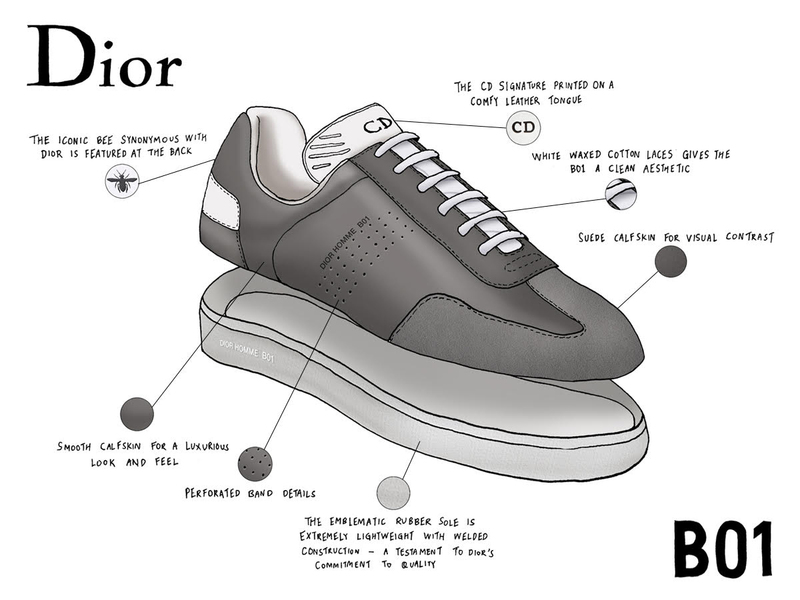 For starters, the all-new B01 comes with a patterned leather tongue that’s emblazoned with the signature CD logo, making it an unmistakable Dior sneaker from afar. Another point of note would be the updated rubber memory sole that’s both lightweight in nature and high on comfort level. And then there’s the addition of the iconic Christian Dior bee over on the sneaker’s heel tab, giving it a nice subtle reference to the Parisian luxury house when seen from the back. Rounding it up would be the side stripe panel that’s now given a perforated treatment, giving the sneaker a cool edge (literally) together with the Dior Homme B01 label etched right next to it. For its Fall-Winter 2018 collection, Dior has released an all-new piece that comes predominantly in a grey and white calfskin (beautifully contrasted with grey suede) upper welded together with the white rubber memory sole. Available at Dior boutiques in ION Orchard and Marina Bay Sands, the B01 Trainer in grey and white calfskin (SGD920) is one pair you wouldn’t want to miss out on, considering it comes with iconic (and added functional) elements from a storied house like Christian Dior.